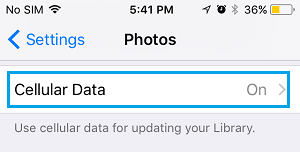 In case you are on a limited data plan and using iCloud Photo Library, it is worth checking whether your iPhone is using expensive cellular data to upload Photos to iCloud. Once iCloud Photo Library is enabled on iPhone, all the Photos and Videos that you take on iPhone get automatically uploaded to iCloud and can be accessed on all your devices. While this feature extends the storage capacity of iPhone, users with limited data plans can get badly burned in case their iPhone ends up using Cellular data to upload photos to iCloud Photo Library. Hence, there is a real need to stop or prevent the possibility of iCloud Photo Library from using expensive cellular data on your iPhone. 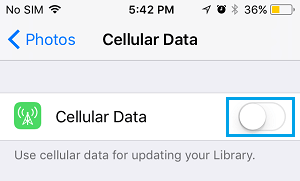 iPhone allows you to disable Cellular Data Usage for the Photos App and you can make use of this to prevent your iPhone from using Cellular Data to upload Photos to iCloud Photo Library. 1. Open Settings > tap on Photos. 2. On the Photos screen, scroll down and tap on Cellular Data. 3. On the next screen, move the toggle for Cellular Data to OFF position. After this setting, your iPhone will no longer use Cellular Data to upload photos to iCloud. 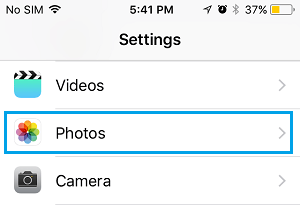 Photos and videos that you shoot on iPhone will only be uploaded to iCloud when your iPhone is connected to WiFi Network.